I know some of you are already reading my Japanese blog, and I'm about to make a new post there as well. I'm keeping all my Japanese experiences to that blog. In the meantime, the posts I've written for This Card Is Cool have run out, and while I have more material to write about, I don't have much time to actually sit and write it down, and even less time to post it. I'm working in an internet cafe right now, which takes about 20 minutes to walk to one way. One week from Monday, I will continue on to my home branch school, where I believe I'll be moving directly into my apartment. I can then get myself organized! In addition, I should have some more time for baseball card writing. I'm not gone, just on vacation, you could say! Though it sure has been a lot of work these past couple of days. I should return to some form of posting in a couple weeks. In the meantime, my writing focus is on the Japanese blog! Japanese Preview: A premium pack! The Japan blog is live: Chaos and Kanji can be found at http://japanryan.blogspot.com! This is the last pack of cards from Jim, and it's certainly the coolest! There are seven cards here, but I wonder if there was an eighth, and this was really two packs. Not that Jim is holding out on me. You'll see. You're not cheating and scrolling right to the end, are you? It's not that exciting. This is the 2008 Swallows Premium set - a design that reminds me a lot of SP Authentic, on what might be somewhat better card stock. It's still about as thick as a flagship Topps card. But again, the card does not feel cheap or flimsy. Here's a gaijin card. His name is in all CAPS, while the Japanese players have only their second name in CAPS. The other releases I showed this week all had stats, but the backs of these cards just repeat the front almost exactly the same, except for a few additions - almost all in Japanese. I know at least one piece of information is the player's birthdate! I've never been a fan of cards without natural backgrounds, but these cards are still pretty nice. Does this card look kind of filmy to you? That's because it's a shimmery holographic parallel! There's no mention of this anywhere on the card. Some parallels have serial numbering, but otherwise this card has no notation as to its name or rarity. But that wasn't the best card in the group. Jim, did you realize this was in here? That is awesome! Is it really signed? 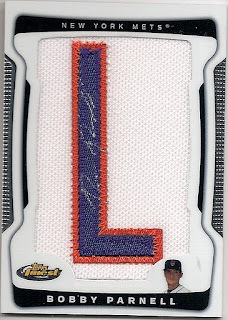 No - it's a facsimile autograph similar to the way Topps puts autographs on the front of their cards. But it's totally cool seeing Japanese signatures. It's like a work of art! And as such I can't wait to get my hands on a couple actual signed player cards. I can't read much of that, but it doesn't matter. I believe the foreigners are card numbers 18, 29, and 34. Note the different characters used in the players' names, and quick verification of the Rios card shows he's number 18.The "autographed" card has a different card prefix (YsS) seen in the checklist as a separate set, so only 10 of the players have a signature version. So there you go - a four-pack preview of some Japanese baseball cards! I'm in training until the end of next week. This Sunday is my first day off, and I'm not sure whether I'll have good internet access or the wherewithal to be writing baseball card posts. Note that I'm writing this post a week in advance, and I don't know yet if I'll have posts ready for the next week or not - so if the blog goes stale for a while you know why! The design is fairly simple, yet different from the 1st Version set issued the same year. This is a 2008 set, which you can tell by looking at the BBM logo at the top and the set name always provided clearly on the front and back. Again the design focuses on good action photography. The complete set runs at least 80 cards, but probably isn't larger than 90 cards. Speaking of 80 cards, here is card number 80, a subset card which I think features veterans or retired team members. The team issue set is just like any other card release - a good-sized base set, plus a few parallels and inserts, including autographs and relics. BBM doesn't overdo the hits like American card sets do, though. Each team in NPB gets its own team set release, and some teams receive multiple releases depending on their popularity and any team milestones (making the championship series or winning the championship, or an anniversary year, for instance). Mascots get their own cards in the set, and even have autographs. Zippy Zappy tells me there are sets devoted entirely to the cheerleaders. I will hunt those down! Remember earlier this week I told you there was something good at the end of the week? It's only 24 hours away! The second "pack" of cards from Jim was BBM's version of Bowman. This is 2008 BBM Rookie Edition. There are two pictures instead of one on these two cards. Notice the 2000 and 2004 dates? These are sort of "retro rookie" cards, and I believe they're numbered later in the set. LaRocca must have played American ball. Through the 2007 season he had a .300 average in NPB, according to the card. The real rookies are here with this golden background. Unlike the "veteran rookie" cards, these have only one picture, and they all appear to be quick portrait shots. Again, the set name is prominently yet tastefully displayed on the front, and is also repeated on the back! By the way, I haven't talked much about the backs or shown you one yet, but they contain mostly Japanese text that I can't read - all English fronts, mostly Japanese backs! Eventually I'll remember to scan a card back, but it won't be this week. Sorry. While the design of the "1st Version" set I showed yesterday focused on the photo, this set has more of a Playoff or non-flagship Upper Deck feel. Tomorrow, we'll look at a set that's not really done in the U.S.
Japanese Preview: Cards from Jim! I met up with Jim one last time before heading overseas, and after a delicious sausage and a totally awesome slice of banana cream pie, we exchanged our little gifts. I was pleasantly surprised to see some Japanese cards he had from one of his friends! There were cards from four different issues (I think!) and I'll spread them out set by set over the rest of the week. There's a great ending on Friday! This first pack comes from BBM 2008 "1st Version" - which is series one. The cards look good. They're photo-focused, with minimal design. The only real design is the translucent yellow-orange border across the bottom with the player's name, team, position, jersey number, and the name of the set. This team checklist is part of the regular set. There are cheerleaders at Japanese baseball games. I am totally going to Japanese baseball games. Notice the green border? Rookies get the green border instead of the yellow-orange border. Of course, it also says "ROOKIE" above the player name. The photo quality is about the same as flagship Topps. The cards are a little thinner, but they don't feel cheap by any means. Another rookie. BBM does a great job of labeling their sets. The "1st Version" on the front also appears on the back. I should have very little problems cataloging BBM cards I find in Japan! Tune in tomorrow for another Japanese pack! Heaven Hits Hard: Trade Draft Hits! I continue to write posts on Friday. When this posts I'll be somewhere over the Pacific, about four hours into my flight and already bored, with another seven hours to go. I'm hoping I'll have an electrical outlet so I can work on my laptop for some of the flight! Meanwhile, here are all the hits from Cardboard Heaven's trade bait draft! This finishes the series. Before mighty Facebook, how would I have found Tom Hanks? This is my juice, and I'm hungry! Like I always said, "Can't police no underwear." I'm gonna dance, make love, and fix snacks for the Highlander marathon! That's right! Women have a special feeling, though. They've got an extra special lady shimmer of no maximum strength. You could be sick, pooping out blood, and you'd still want them! Happy Hoops Day. Look at me! Anybody shoot rabbits? Watch out for these spiders! Big potato moths! Big potato moths! I don't know how I got so many autographs in the draft, but I'm happy to have them! I think most of them are needed for the type collection. Speaking of hits, here's some Mike Tyson quotes. Oh yeah, I've got swag. Because everybody needs toucan stubs. Today's the day. Well, I say "Today's the day" but I'm writing this post on Friday. I'm already a mess. Who knows what I'll be like today. Writing the posts for this weekend has made me all emotional and nostalgic and all that other estrogen-filled crap I'd rather not think about. I need to watch some NASCAR and drink some beer. Or shoot a defenseless animal. Or tackle someone carrying an egg-shaped piece of pig skin. What other manly things are there? Um, I should drive my 1960s sports car really fast over the San Francisco hills. Or fish. Or not talk about my feelings. I love this animation. I've shown it to my students as, um, a diversion for a couple years. I have to explain it to some of them, even though they're high schoolers - partly because they don't know what "diversion" means and partly because they can't understand the emotions as conveyed through the signs' body language. I suppose I should show some cards. Will I begin Lineage insert set building? This might be the start! You can consider insert cards from Lineage to be trade bait for me. 60 Years of Topps. But this is going towards my Awards collection. I was going to use Mr. Ruth here in my awards collection as well, but I might have filled that spot already. Another Alomar needed for his Gold Gloves! I didn't realize this until recently - the "Pro Debut" logo is a MiLB thing, not a Topps thing. Pro Debut might be a required logo or set name/issue in the Topps/MiLB licensing agreement. Another card I was going to use in the awards collection, though again I might not need it. I like this card, though. Topps HD is a great looking set. This insert would have been so much better without the giant letters in the background graying out the wonderful colorful printing. I think the woman who inspired this character no longer works at Topps. Every time I see one of these cards I want to get it! Last, this may be the best card I pulled in Cardboard Heaven's trade bait draft. 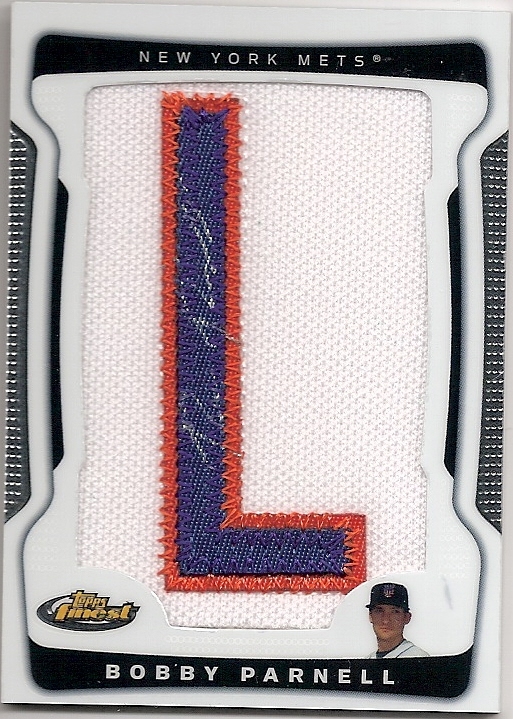 I still have some hits to show you later, but I think I placed this card as my number one non-hit pick, and it might have been in my top five. It's from the Black Friday promotion, and the black borders are thicker than they appear (thanks, scanner). I was quite excited to see this, even if a year or two down the road I see a bunch of them in a dime box! Type the word "Party" into a YouTube search box and this is one of the first videos that shows up. Let's see what kind of patriotic videos I can come up with for the end of this post, shall we? Bowman Platinum is such a waste of foilboard, though it does have a Team USA subset. I've been making pretty good progress on the team set though! Wait, Tigers hat and USA jersey? What's going on here? And isn't that hat just a little too big for him? He looks like a 12 year old with that goofiness going on! Ack! More Platinum! Foilboard apparently doesn't scan well. Yep. That picture really stands out, though the Bowman Platinum logo has great placement on these two cards. We can see that one! And I think Mr. Hood here is in the 2011 Team USA box set, too. Cameron's draft was truly awesome! I still have a couple more posts worth of cards for you folks. Meanwhile, let the videos begin. I love the vintage feel of this song and its video, and Christina Aguilera looks good. And it's kind of patriotic! Is that two posts in a row with a Team America video? F yeah! I had to put in a clip from my favorite movie. It's a great song, a great scene, and hey - she's leaving home too! Zooey Deschanel is one of my favorite actresses, and it started with this movie. One day, you'll be cool. Yeah, it's a party! I guess? And if you have never seen the original music video for that song, it's Michael Jackson epic (though nothing will ever be as good as a Michael Jackson video). Tomorrow, I fly to Japan! Did you enter my contest? Last chance! Two thousand two hundred eighty two. It took a month, but this card is COOL! On tour with 2009 O-Pee-Chee. Trade with a Facial Cleansing Product! A new year, a new life, and a new contest!